Val Deniston knows that her grandfather’s plan to cement his position as an excellent cook is a bad idea. After all, the man can’t even cook. But, what Granddad wants, Granddad gets, including the title of “Codger Cook.” So, they set up the dinner to appear as though the Codger Cook made the meal even though Val did all the work. At the dinner party with five guests, one of the guests becomes very ill and soon dies of food poisoning. It looks like the Codger Cook’s reputation may be ruined unless Val can determine who poisoned the dead man. Things go from bad to worse when it’s discovered that the dead man was a con artist who scammed the Codger Cook’s best friend. With none of the other guests talking, it looks like the Codger Cook may be facing murder charges. Val begins checking out the suspects, who range from a reporter eager to expose the Codger Cook as a fraud to her Granddad’s gold-digging girlfriend. As the evidence piles up against her grandfather and another one of the guests is murdered, Val realizes that she must dig deeper to save her grandfather from being charged with murder. This is the second of Maya Corrigan’s five-suspect, five-ingredient, five-clue murder mysteries. 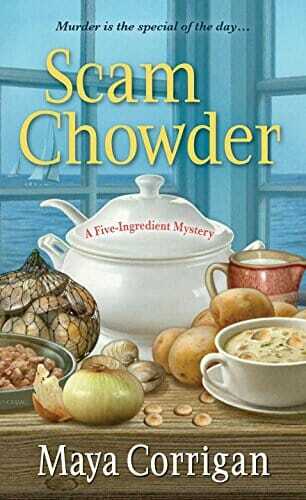 The focus in “Scam Chowder” is definitely on the plot and clues. Val Deniston is a likable protagonist. Other characters are interesting, but not compelling and the writing became somewhat predictable. The plot, however, was well-layered and fans of puzzle mysteries will enjoy the opportunity to sift through the clues to solve the puzzle.